A covered bridge spanning Spring Creek west of Springfield was destroyed in what was thought to be an arson fire on Dec. 26, 1977. The bridge – known as the Spring Creek Covered Bridge, the Riddle Hill Bridge or the Curran Bridge – had been built in 1883 by Thomas C. Bucher (1853-1914), an area carpenter, contractor and builder. The structure, probably made of oak (although a metal roof was added in the 1960s), was 13 feet wide and 12 feet high and spanned a total of 130 feet. In 1977, the bridge was on County Road 5.5W, between Washington Street and Illinois 97. The road since has been renamed Old Covered Bridge Lane. 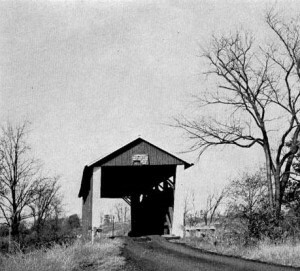 When it was destroyed, the Sugar Creek Bridge was one of only two covered bridges remaining in Sangamon County and one of only nine in the state of Illinois. The sense of antiquity is strong along Spring Creek, but now a symbolic part of its more recent history has, as one curious young observer noted, been “wasted.” No more can long-rooted residents return to gaze at initials methodically carved in “courtin’” days when the bridges were often referred to as kissing bridges. Even the often objectionable sight of names hurriedly scrawled with spray paint are vanished – someone’s clandestine immortality gone up in smoke. No arsonist was ever identified, and the covered bridge was replaced by a concrete bridge. The only remaining covered bridge in Sangamon County spans Sugar Creek near Glenarm. No longer in use, it is part of Pioneer Park, maintained by the Chatham Park District. More information: At least 30 covered bridge sites have been identified in Sangamon County, according to an article posted on a family history web site, Genealogy Trails. The writer – Genealogy Trails contributors appear to all be volunteers – is not identified, and the chronology in the post is confusing, suggesting much of the material may have originated with an old county history and then been updated. (Also confusing is the fact that the entry begins by mentioning four bridges in Christian County.) A check of newspaper articles about several of the bridges mentioned in the Genealogy Trails entry indicates its facts are largely correct, but SangamonLink cannot vouch for its full reliability. The entry also includes photos of a number of the old bridges. This entry was posted in Architecture, Historic Sites, Transportation. Bookmark the permalink. In the summer of 1966, as a Junior/Senior at WIU, i created a color slide sequence with Abe Lincoln in Sangamon County being the subject for a photography class. One or two (i would have to check) of the slides has this bridge as the specific subject. Through the years I have used the slide sequence when presenting a Lincoln program to grade school, high school, adult learning, vets, service and political organizations. Andy: Yes, I’d definitely like to see your photos of the old covered bridge. You can email it to me directly at mkienzler@msn.com. I assume I would have your permission to use it on SangamonLink? Thanks a lot.